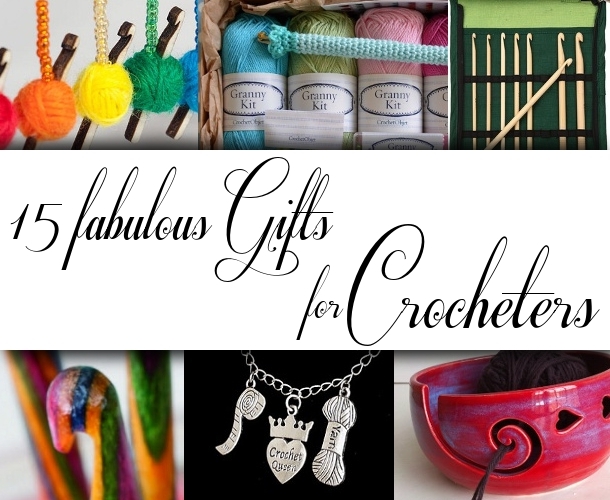 Not sure what to ask for this year aside from yarn? (Or, alternatively, are you shopping for a crocheter with no idea of what to buy for them because all they said was, “No, seriously, buy me yarn”?) Take a look at our 2013 Wish List for some inspiration! This ‘Emergency Fix’ keychain is intended for knitters to use to rescue dropped stitches, but we all know that’s ridiculous. It makes much more sense for crocheters to take these along with them for when you need an emergency crocheting fix! 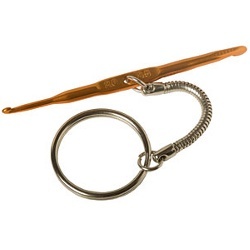 One side has a 2.0mm hook and the other has a 3.5mm hook; attach to your keychain so you’ll never find yourself without a hook to crochet with. Who doesn’t need hooks? Whether it’s to replace some recently lost, allow you to work on (ahem) multiple projects with the same size hook without pulling one out of your work, or just to expand the sizes you have, these multicolored aluminum hooks ranging in size from 2mm to 8mm is the way to go. For a sweet and simple way to show your love of yarn, look no further than these delicate yarn ball earrings. The charms and earwires are silver plated, what a great deal! 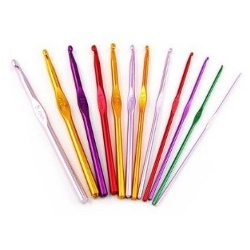 Brighten up your hook collection with a Harmony crochet hook! 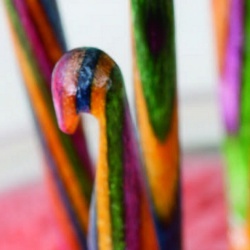 Made of laminated birch in a rainbow of colors, the Harmony hooks are available in size E(3.5mm) all the way up to a 12mm hook. Prices vary by size, choose your favorite! 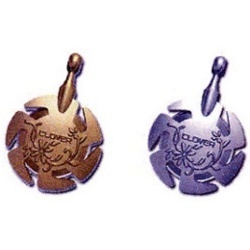 Available in Antique Gold or Silver to match your style preferences, these Clover Yarn Cutters can be worn around your neck as a pendant, assuring that you will never be without a way to cut your yarn again. Everyone needs a tape measure, why not make it fun? 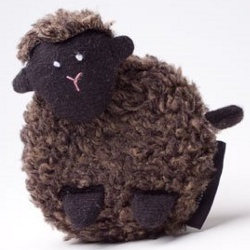 The tail pulls out of this little brown sheep to reveal a 60″ retractable tape measure (but if you’re feeling metric, centimeters are on the other side). Approximately 2.25″ in diameter, they’re the perfect size to tuck into a project bag. 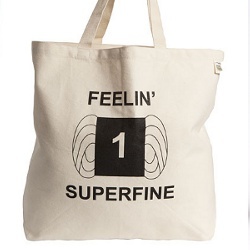 We all know you’re ‘superfine,’ but there’s no reason to keep it a secret. This 100% organic cotton tote is 19″ x 15.5″ with a 5″ bottom gusset for holding even larger projects. Also available as a project bag for $8.99. 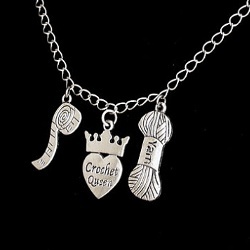 This would make a great gift for the ‘Crochet Queen’ in your life – and hey, you’re in your own life, aren’t you? If a bracelet would be more your style, the shop owner does custom orders. 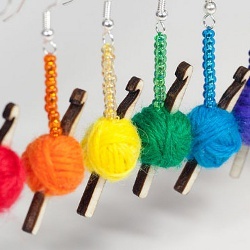 Choose from nine different colors of yarn for these crochet hook and yarn ball earrings. Don’t see your favorite color among those listed? The shop owner does custom orders! If you’ve ever wanted to try making jewelry with wire crochet, here’s a good place to start. This complete kit includes a video CD, a PDF tutorial, an appropriately sized crochet hook, 2 spools of color wire, a starter loom and a clasp. If this particular design doesn’t appeal to you, try a different kit from YooLa! Here’s a great gift idea! 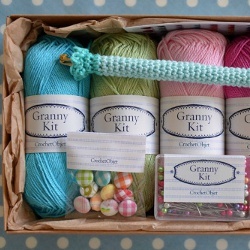 This Granny Square Kit comes with four coordinating cotton yarns (you choose from several available color schemes), 2 crochet hooks suitable for using with the yarn, sewing pins, and 12 fabric covered buttons. It comes in a box for attractive giving. 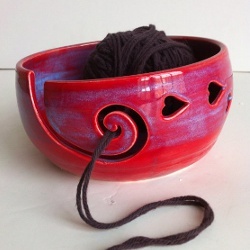 Ceramic yarn bowls are along the lines of a functional art piece – beautiful to behold, but also able to corral your wayward ball of yarn. A variety of handmade styles and colors are available from New Moon Studio. 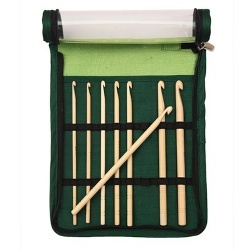 Bamboo crochet hooks are quiet, light, and feel wonderful in the hands. For a special present, why not pick up this set of 8, complete with case? Sizes E, F, G, H, I, J, K & L are included. Get started on blocking with this starter tool kit. It includes blocking mats, T-pins, blocking pins, two kinds of wool wash, project care labels, a lint shaver, and a $30 gift certificate for KnitPicks yarn! Really…if you want to begin blocking, I don’t think you can beat that. 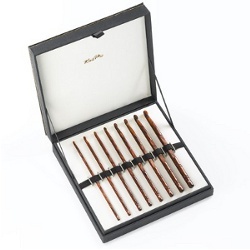 If you’re going all out this year, why not splurge on a boxed set of rosewood crochet hooks? Each is tipped with a Swarovski crystal on the handle. Sizes E, G, 7, H, I, J, K, L.
I wish I had two of each of these – they are all so useful!